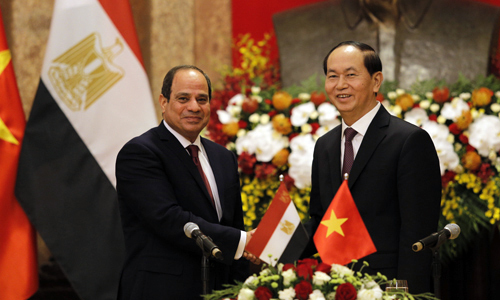 This is the first visit made by an Egyptian president to Vietnam in 50 years. Egyptian President Abdel-Fattah El-Sisi is in Vietnam at the invitation of his Vietnamese counterpart President Tran Dai Quang on a mission to boost bilateral ties. His trip marks the first visit by an Egyptian president to Vietnam since the two countries established diplomatic ties in 1963. El-Sisi confirmed the importance of the trade between Egypt and Vietnam at a meeting in Hanoi on Wednesday, and said he wished to enhance cooperation in this area. Quang said the visit was an important milestone that will strengthen the relationship between the two nations. The two presidents witnessed the signing of nine cooperation agreements on trade, investment, tourism, culture, maritime transport and fishing, as well as a memorandum of understanding between Vietnam's Ministry of Planning and Investment and the Egyptian department in charge of the expansion of the Suez Canal, a project that will play a key role in global trade. Having set a two-way trade target of $1 billion, the leaders also promised more mutual support in different fields.